With the Thanksgiving holiday nearly upon us, cooking healthy meals is on our minds. That brought us to Mary’s Center, a health center in Washington, D.C. Mary’s Center is no ordinary health center. The site we visited in the neighborhood of Fort Totten (one of 8 locations) opened just two years ago and operates a public charter school called Briya. The school is equipped with a working kitchen that operates as a weekly culinary classroom for parents and health center consumers called “Cooking Matters.” Attendees not only learn healthy meal recipes from a medical nutritionist, but how to shop wisely and read food labels to avoid excess sugar and salt in recipes. The classes are free and last six weeks. Health centers have a long history of approaching health care by addressing the social determinants of health; rather, the factors that can affect one’s health. Nutritional eating is a big part of that and why Mary’s Center has incorporated the program into their range of comprehensive services. 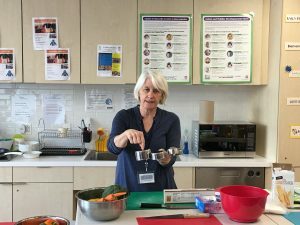 The “Cooking Matters” sessions are conducted in both Spanish and English, with handouts that detail food preparation, nutritional guidelines, and tips on understanding food labels. 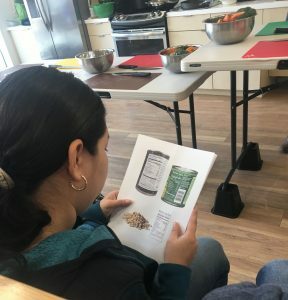 We dropped in while participants were learning about the value of whole grains, how to choose vegetables and fruits, as well as how to add them to meals. Attendees were also shown how a simple recipe can be prepared a variety of ways, with different sauces and proteins. We tasted a dip made with white beans and it was delicious. 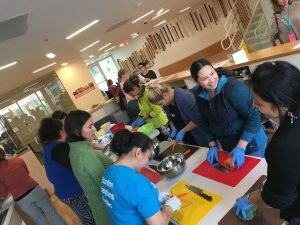 The weekly “Cooking Matters” class offered at Mary’s Center is just one reason why the center won the 2018 Health Center Quality Award for generating good health outcomes among their patients. Does your health center address patients’ social determinants of health through nutrition? If so, let us know. We’ll feature it on this blog.